The examiner’s first Office action will be a statement of the examiner’s position and should be so complete that the second Office action can properly be made a final action. See MPEP § 2271. The first Office action must be sufficiently detailed that the pertinency and manner of applying the cited prior art to the claims in each rejection is clearly set forth therein. 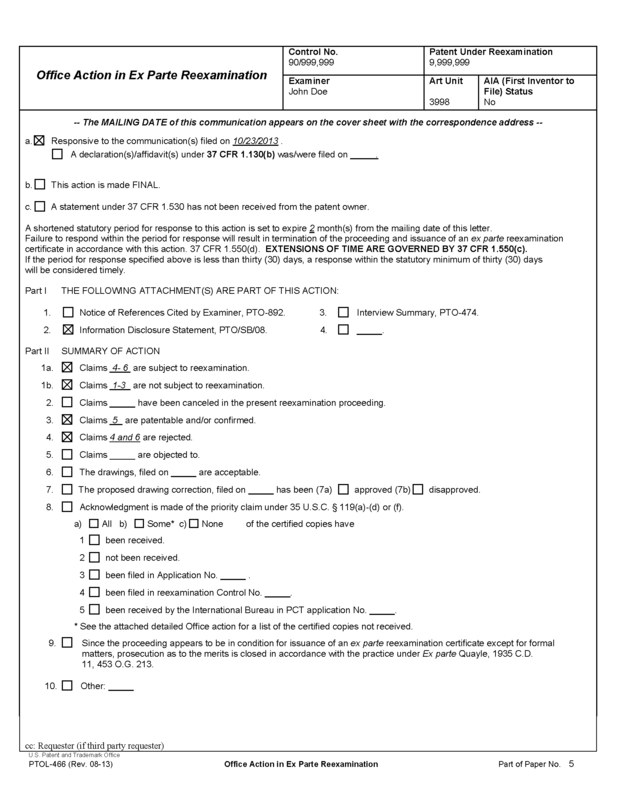 Where the request for reexamination includes material such as a claim chart to explain a proposed rejection in order to establish the existence of a substantial new question of patentability, the examiner may bodily incorporate the claim chart (or other material) within the Office action. The examiner must, however, carefully review the claim chart (or other material) to ensure that any items incorporated in a statement of the rejection clearly and completely address the patentability of the claims. For actions subsequent to the first Office action, the examiner must be careful to additionally address all patent owner responses to previous actions. 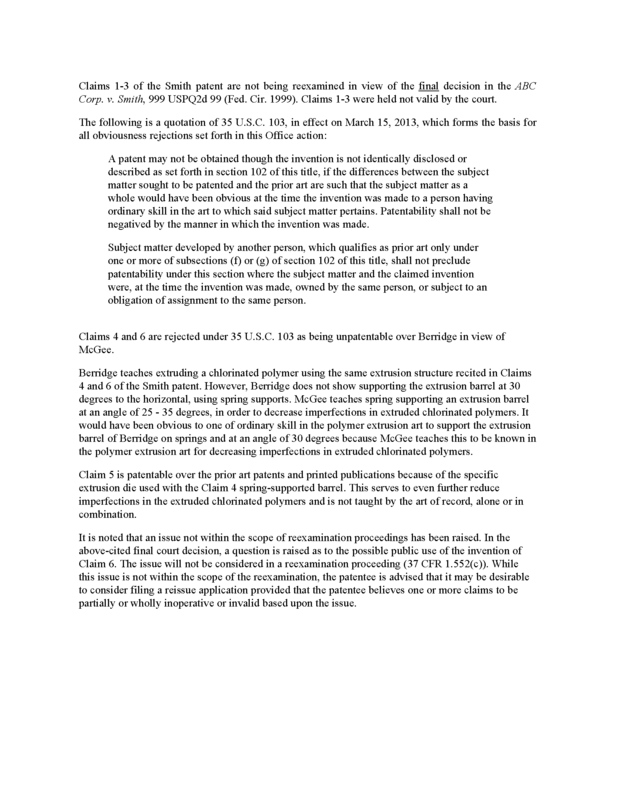 If the examiner concludes in any Office action that one or more of the claims are patentable over the cited patents or printed publications, the examiner should indicate why the claim(s) is/are clearly patentable in a manner similar to that used to indicate reasons for allowance (MPEP § 1302.14). If the record is clear why the claim(s) is/are clearly patentable, the examiner may refer to the particular portions of the record which clearly establish the patentability of the claim(s). The first action should also respond to the substance of each argument raised by the patent owner and requester pursuant to 37 CFR 1.510, 1.530, and 1.535. If arguments are presented which are inappropriate in reexamination, they should be treated in accordance with 37 CFR 1.552(c). If any statement of the patent owner submitted pursuant to 37 CFR 1.501(a)(2) is relied upon in the detailed explanation, requester must have explained how that statement is being used to determine the proper meaning of a patent claim in connection with prior art applied to that claim. That explanation will be considered by the Office, when drafting the Office action, in determining the scope of the claims of the patent which are subject to reexamination. It is especially important that the examiner’s action in reexamination be thorough and complete in view of the finality of a reexamination proceeding and the patent owner’s inability to file a continuation proceeding. Normally, the title will not need to be changed during reexamination. If a change of the title is necessary, patent owner should be notified of the need to provide an amendment changing the title as early as possible in the prosecution as a part of an Office Action. If all of the claims are found to be patentable and a Notice of Intent to Issue Ex Parte Reexamination Certificate has been or is to be mailed, a change to the title of the invention by the examiner may only be done by a formal Examiner’s Amendment. Changing the title and merely initialing the change is NOT permitted in reexamination. 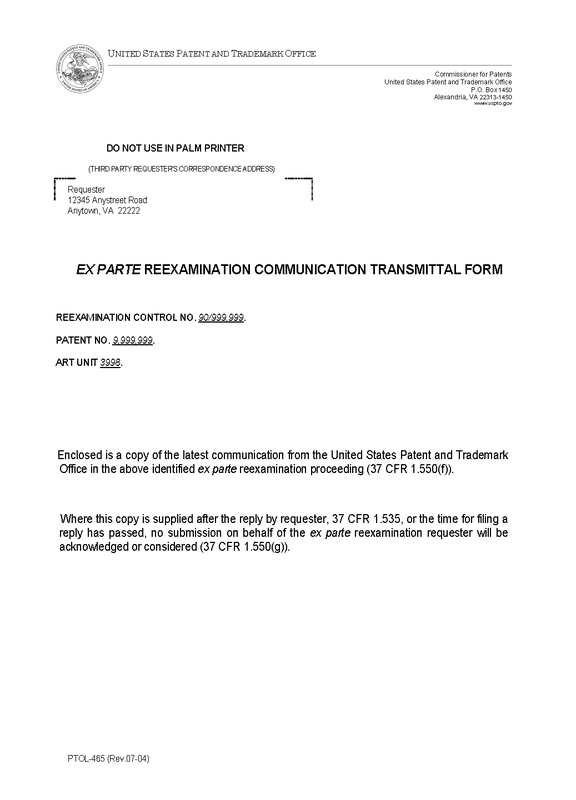 Current procedure permits the examiner, in the exercise of professional judgment, to indicate that a discussion with the patent owner’s representative may result in agreement whereby the reexamination proceeding may be placed in condition for issuing a Notice of Intent to Issue a Reexamination Certificate (NIRC) and that the examiner will contact the patent owner’s representative within about two weeks. Under this practice the patent owner’s representative can be adequately prepared to conduct such a discussion. Any resulting amendment may be made either by the patent owner’s attorney or agent, or by the examiner in an examiner’s amendment. 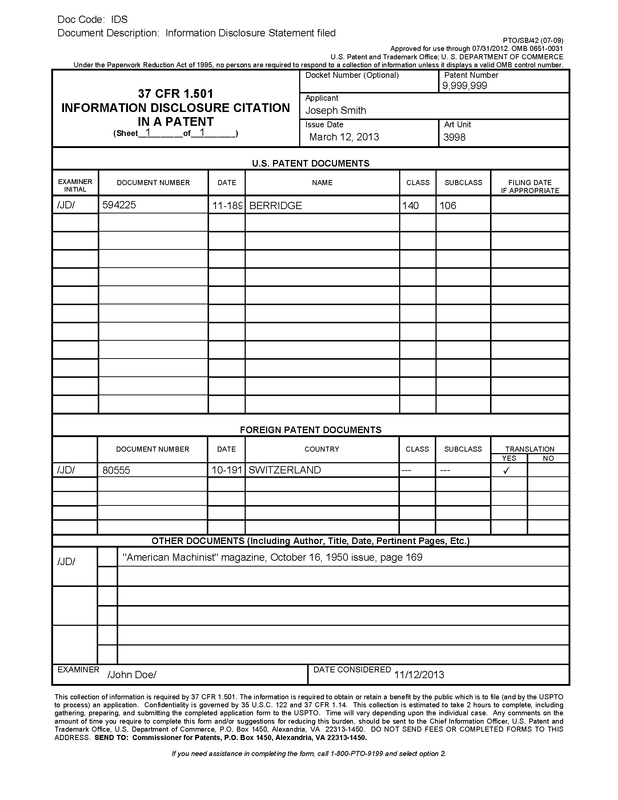 It should be recognized that when extensive amendments are necessary, it would be preferable if the amendments were filed by the patent owner’s attorney or agent of record since this will provide the file wrapper with a better record because the amendments would include the patent owner’s arguments for patentability as required by 37 CFR 1.111. 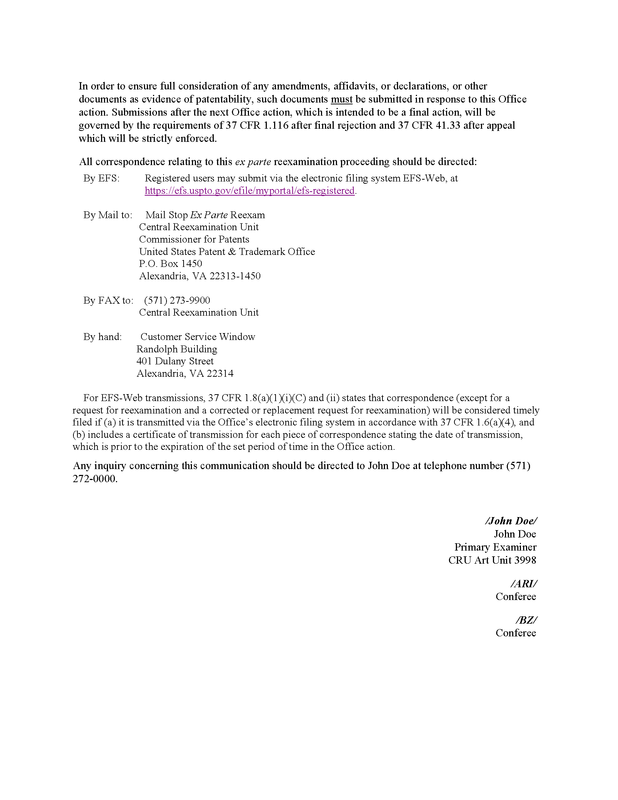 Upon receipt of a patent owner response to the action by the CRU, or upon the expiration of the time to submit the response, the examiner will be notified. The examiner will prepare for and set up a panel review conference as per MPEP § 2271.01, to discuss the issuance of the Office action. The examiner may prepare the Office action after the conference, or may prepare the Office action prior to the conference and revise it as needed after the conference. See MPEP § 2271.01 for more information on policies concerning conferences. If the conference confirms the examiner’s preliminary decision to reject and/or allow the claims, the Office action shall be issued and signed by the examiner, with the two or more other conferees initialing the action (as "conferee") to indicate their presence in the conference. A sample of a first Office action in a reexamination proceeding is set forth below.